Imerge announced the arrival of its XiVa music store this week, something it hopes will mark an 'evolution' of online music purchasing. The store is in collaboration with 7digital. Essentially, through your Imerge machine you will be able to purchase content from the 7digital download store, which has been given a whole new user interface. 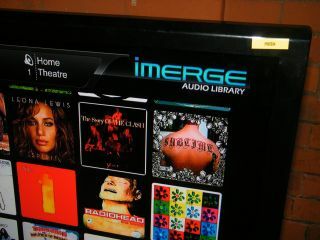 The store is currently only available on Imerge's flagship AV server, the MS1-HD and the company's MS1 and AS1 products. Chatting to an Imerge spokesperson at the launch event, they explained that this was just the beginning of the service and it's possible that it will be rolled out to other Imerge products. It also seems that there is even the potential that the store will be prepped for use on mobile phones at some point. This is because the UI is using Silverlight. At the event in London, TechRadar managed to get hands-on with the store and were impressed with what we saw. The UI is sleek and it's plain to see that it's been built with TVs in mind. This is the main draw for the XiVa store – it's meant for the living room. This is not sit-forward experience like iTunes on your PC or Mac, this is all controlled through your remote control and it's all the better for it. The browsing on the store can be done in a number of ways. Through physically typing in the name of the track – involving cursor pointing and clicking – or visual searching through the myriad albums on offer. We found that looking at the cover art while browsing was the best way, simply because the high-resolution images sparkled on the hi-def TV. The amount of songs on the store is immense – we're assured it's around the 8 million mark, with more added to the database on a weekly basis. What is also good is that there is a preview option for every track, so you can try before you buy. It's only 30 seconds but it's enough time to make your choice. Once you have selected a track, it's a simple process to paying for it. At around 99p for a song, though, it's definitely not the cheapest music service we have tried. The downloads come in the form of DRM free 320Kbps MP3. While this is certainly high quality. We would have expected FLAC to be available, especially for playback on something as high-end as the MS1-HD but this is an audio option 7digital only offers for five albums at the moment. Apparently, this codec will be available at a later date. The great thing about the music you buy is that it is not locked to your system. Because of something called a 'Skylocker', you can transfer the music to your iPod, or whichever device you wish. Once done, you will get all the metadata associated with the track. The XiVa Music Store is a great additional feature to those who have spent thousands on their Imerge system. Available as an update this week, it's a genuinely decent piece of software which opens up the opportunities of music listening in the home. Yes, there are others on the market – namely Kaleidescape – but the XiVa Music Store is definitely a contender. And the only one at the moment offering a music store service. There is a problem, though. This isn't enough to bring people to purchasing a MS1-HD – it's more a thank you to all those who have already got the devices in their home. The pieces of kit which have the store are expensive. Very expensive. This is for good reason, though, as the system offers superb video quality, audio performance, versatility and openly upgradeable architecture. With promise that this store will be spread across to products that are in a price band which will entice everyday consumers – the XiVA musicm8 maybe? – it looks like Imerge could well have a winner on its hands.